Introducing the Item Options System! The Item Option System is a feature that was implemented in 2015-02-26 clients, allowing equipments to have up to 5 additional effects similar to cards or enchants. Each equipment is capable of having 5 information bars above the card slot/enchant bar that describes the effect of the option it is infused with. This function checks if the equipped item allows the use of bonus options. Returns 1 if allowed, 0 if not. Returns the value of the current equipment being parsed. If the equip was not found or the type is invalid, -1 is returned. Gets the option information of an equipment. <equipment_index> For a list of equipment indexes see getequipid(). <type> can be IT_OPT_INDEX (the ID of the option bonus, @see "Id" or "Name" in db/item_options.conf)       or IT_OPT_VALUE (the value of the bonus script of the equipment, @see "Script" in db_item_options.conf). returns the value of the slot if exists or -1 for invalid slot, type or slots. Set an equipment's option index or value for the specified option slot. <value> The value of the type to be set. returns 0 if value couldn't be set, 1 on success. This system allows the infusing of equipments with bonus item options. This feature is constrained to clients of packet versions greater than or equal to 20150226. The ID of the option must tally with the correct index of the description provided in the client side file. IT_OPT_* keys and MAX_ITEM_OPTIONS macro are also exported from the source as constants. If you wish to disable item options for certain (equipment) items, an additional flag `disable_options` has been added to the item sql tables, and as `DisableOptions: true/false (boolean, defaults to false ! !for equipments only!! )` to the item_db.conf files. Documentation is provided for script commands. If upgrading, don't forget to run the sql upgrade files! Emistry, dastgir, MishimaHaruna, Jedzkie, Ridley8819, Asheraf, 4144. Initial design Idea in rAthena commit. Looking for scripts for this, Item options for all equipments / costumes slots. no sample script located. I found two of them but it's outdated. will try and modify my thread after work. TLDR: I tried using the one from the DEMO NPC from the utility section and tried to modify the menu to just show costumes side but I get this. Isn't the parameter on getequipisequiped and getequipname wrong? 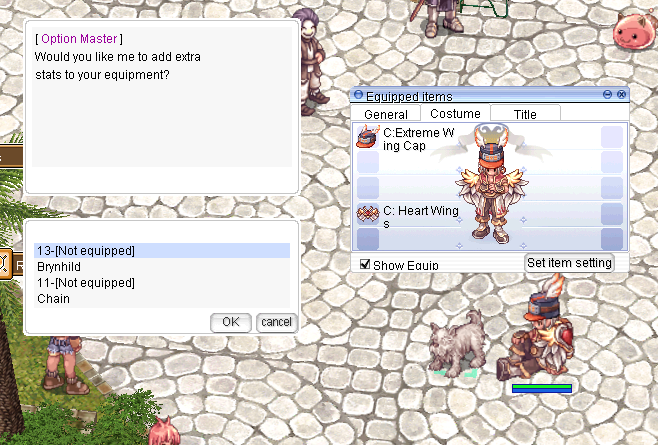 [email protected] will be 1, 2, ... which are EQI_HEAD_TOP (1), EQI_ARMOR (2) and not costume slots. Yes it works for the normal equipments, but how do I make it so just for the costumes?